Now that millinerd.com has officially outlasted The Dish, people have asked me if I have a formula for success over the long haul. If only it were so simple! But come to think of it, there is one thing I've have carefully avoided, which may be part of this website's enduring resilience: I never self-promote. Why deprive others of the thrill of discovering my genius on their own? Consequently, I spend most of my time pointing out the merits of others. Consider, for example, Professor Matthew Williner, who (see image below) recently gave a lecture at Duke Divinity School, co-sponsored by Duke's art history department. 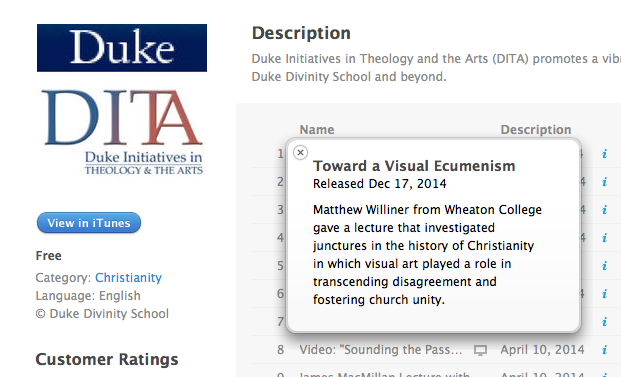 It is available at the DITA iTunes page (filled with lots of other good stuff) under the title, "Toward a Visual Ecumenism" (here's a permalink). Whoever this Williner guy is, he has the answers, and the problem of Christian fragmentation may very well have been resolved in our time.